NDA admit card 2019 will be made available for download in the month of March 2019. We will provide the direct download of NDA 2019 admit card here. Read all the nda hall ticket information below. UPSC has released an application for the admission of 392 candidates in NDA (National Defence Academy) and NA (Naval Academy) in the month of February. Application procedure has been closed now but candidates who wish to withdraw their application and can do so before 14th February 2019. Latest: NDA 1 Admit card 2019 Released on 29th March 2019. 2 How to download NDA admit card 2019? NDA admit card will be issued through the official website only to the registered candidates. No hard copy of NDA hall tickets 2019 will be made available for the candidates. For more details regarding NDA 2019 admit card readers must go through the article. UPSC issues admit cards to the candidates three weeks before the commencement of exam which means Admit card for NDA 2019 exams will be issued in the month of March 2019. NDA admit card/hall ticket or certificate of admission will be issued only through the online mode i.e. an e-admit card will be issued to the candidates. No hall ticket will be sent through the post. Candidates are required to download it from the official website of UPSC. It is compulsory for all the candidates to carry the admit cards to the examination center on the day of the exam. No candidate will be allowed to take the examination without the certificate of examination. How to download NDA admit card 2019? Candidates have to visit the UPSC official website (www.upsc.gov.in). On the homepage, they need to open the “Admit Cards” Tab. Candidates now have to click on the NDA e-admit card link. They have to enter the RID & Date of Birth or Roll No. (if received) & date of birth or name, father’s name & Date of Birth in fields provided. Admit card will appear on screens; candidates can check all the details mentioned on it. Candidates finally have to download and take a printout of the hall ticket for future correspondences. 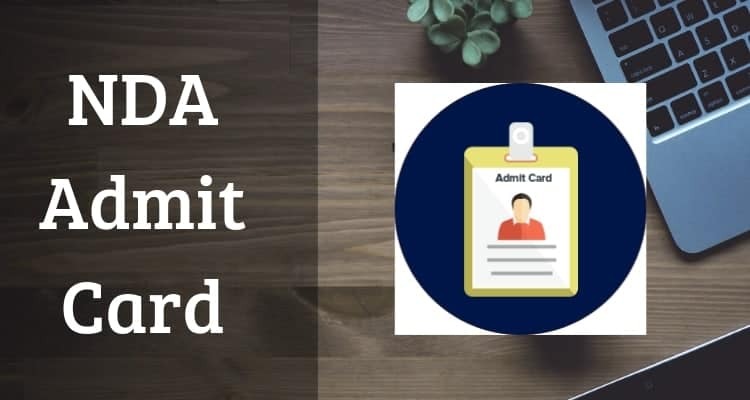 NDA e-admit card will hold crucial information about the exam and candidates due to this reason all the candidates have to bring the admit card to the exam hall positively. Candidates must verify all the information mentioned on the admit card. In case of any discrepancy or error in the information, candidates must immediately bring the discrepancy to the notice of UPSC. Candidates are allowed to carry only the valid admit cards to the examination hall. Apart from admitting card and necessary stationery (hard/clipboard, black ball pen) all the other items are restricted to be carried the exam premises. Candidates are, therefore, advised to read and follow the instructions mentioned on admit card before and during the conduct of exam. The items that are restricted/ banned at the exam hall include mobile phones/ Bluetooth/ pagers/ electronic gadgets, books, papers, log table, log tables, slide rules stencils, or any costly/valuable items. Any candidate found with any banned item at the exam hall (exam premises where the exam is being conducted) shall be debarred from the exam. The commission will not be responsible for any damage or loss of any of these banned items. Examination centers are allotted to the candidates on “First-Apply-First-Allot” basis. Request for change will not be accepted under any circumstances. Exam center information will be mentioned on the admit card. After the completion of the written examination, UPSC will issue the answer to key the question paper. As it is updated on the official portal, candidates have to download it from there only within the specified schedule. NDA result for written exam will be declared in the month of June 2019 as mentioned in the official notification. Candidates can check their results on the official website by using the login credentials. After the declaration of result, UPSC will also declare cut off and merit list. Candidates qualified in written exam will be called for interview and personality test round. NDA I admit card for 2019 is likely to be issued online in the month of March 2019. Mere the issue of admit card does not indicate that the candidature of the candidate has been finally cleared by the commission. It is provisional and final selection will be based on the evaluation of the performance of candidates in various stages of the selection process. In case, candidates want to communicate UPSC for any issue related to the admit card or any other issue communication must involve following particulars- Exam name and year, RID, Name of the candidate, Roll No., and postal address as provided in the application. Any communication not containing these particulars will not be entertained. Candidates must notice that the name in the e-admit card may be abbreviated by the commission due to technical reasons. Aspirants can also comment there query below.